If you love guitar, this album is a must. 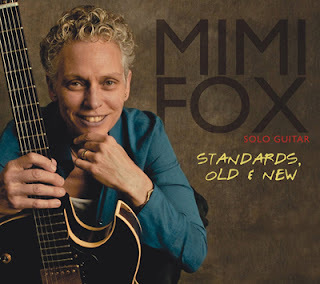 This instrument isn’t often presented in a solo jazz format, as is the case with this release, but the artist rarely is as talented as Mimi Fox. She’s a New York City native who began her music career at age 9 playing drums, then switched to guitar a year later. The first album she purchased was John Coltrane’s Giant Steps, a choice that settled her musical future. She began playing and touring professionally as soon as she graduated from high school, and ultimately made her home in San Francisco. She is, in my opinion, the most eloquent — yet swinging — guitarist playing today. You needn’t take my assessment as fact; master artists such as Jim Hall and Joe Pass have given her rave reviews. This album features 10 tracks, each a well-known standard. Some might think that’s a lot of guitar to embrace at one setting, but when the last tune faded out, I immediately hit “play” and listened to everything again ... and I’ve played it at least once every day since. Most of the tunes are done at ballad tempos, and that’s where Fox’s marvelous style and eloquence are most evident. But when she swings — “This Land Is Your Land” is an example — oh, how she swings! Fox has played an uncountable number of concerts, internationally and in the States; she has worked with dozens of name artists; and she also teaches. All that aside, every song she performs is done with love and her full attention; she never sounds bored. Just listen to the wonderful Vernon Duke tune “I Can’t Get Started” or Lennon and McCartney’s “She’s Leaving Home,” as examples. Every song on this disc demands your full attention. Fox has released nine albums thus far, several of which have featured her in a solo mode. If she affects you as she has me, you’ll want to track ’em all down and add them to your library!